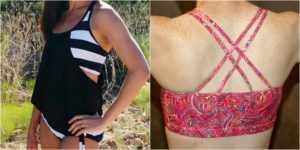 It occurred to me that we needed a roundup post of all of the women’s swimsuit patterns available at 5 out of 4. So…here it is! 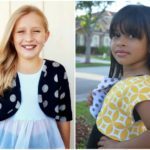 I hope you find something you love and, hopefully, we can keep this updated with new patterns as they are released. Most of the 5oo4 patterns have multiple uses, so if some of these don’t look like swim patterns in the listing photos, just know that I’m putting them here because they have been used as a swimsuit pattern with success. The Agility pattern includes a sports bra and overlay tank and dress. All options include the choice of nursing style, maternity, T-back, or strappy back choices. The tankini cut lines have a lower armscye, so more skin shows, but you’re still modestly covered at the beach. You can also see blog posts where we’ve done an Agility Sewalong here. The Escapade includes a bikini, tank, and dress options and it includes a maternity option. Instructions are given for removable cups. 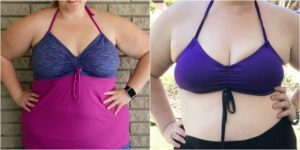 The Journey includes a bra, a tank (with built-in bra), and 2 dress length options (including maxi), as well as nursing and maternity options. 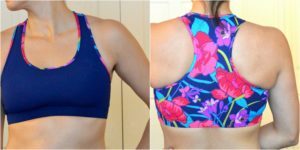 While technically the Resolution is part of a bra and tank combo meant for working out, the racerback sports bra can easily be made with swim material. 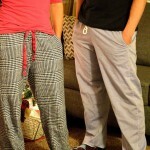 The Versatility Tank and Pants was originally intended as sleepwear. 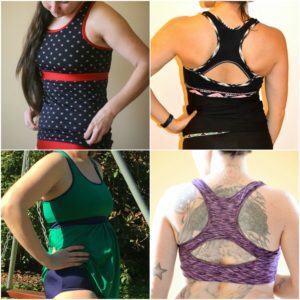 The tank is form fitting and includes nursing and maternity options and a built-in bra. You could also just use the bra as a bikini top. 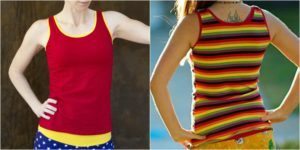 The X-Factor includes a bikini, straight or gathered tank, a maternity tankini with ruching detail, and a nursing option. Now onto the bottom half! From left to right: Riptide Reversible Shorties, Shenanigans Skort, and the Women’s Boardshorts. The Riptide Reversible Shorties are reversible swim shorts with three rise options (including maternity) and side ruching for different leg heights. You can see all of the posts from the Riptide sewalong here. The Shenanigans Skort wasn’t originally intended for swimwear, but the shortest length is a great swim skirt! 3 rise heights (including maternity), 3 lengths for the skirts, and 4 lengths for the shorts underneath! You can also pair the Shenanigans Skort with the Ninja Leggings to have full leggings under your skirt. You can see all of the posts for the Shenanigans Skort sewalong here. The Women’s Boardshorts don’t have a liner built-in, but they are perfect over the Ultimate Bikini Bottoms. 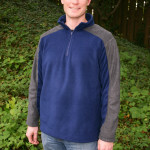 The pattern includes 4 inseam lengths. The Ultimate Bikini Bottoms include 4 rise heights, 2 leg heights, an optional skirt, and they can be made reversible. 4 rise heights, 2 leg lengths, and legs can be finished with hem or band. Shorts can be made solid or color-blocked. Whew! We love making swimwear and try to come out with at least one new swim pattern every year. I hope you see something you love! 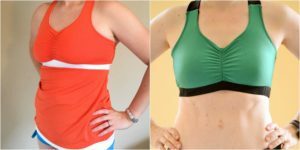 I also highly recommend these two blog posts for information on how to either sew in swim cups or create a suit with removable swim cups.